“There’s no surf in Texas.” Yes, please continue perpetuating this line – it leaves all the waves for us. Or, just don’t tell anyone and quietly slip away to the “Third Coast,” which is only three and a half hours from Austin, have some waves for yourself, then return and tell everyone it was flat. Often, it’s true. Driving from Austin to the Texas coast in search of surfable waves might be a waste of time. Marine conditions are notoriously fickle; swells are usually short-lived; and Texas is big – with over 600 miles of coastline – so drives between spots are long. But take a couple days to sneak to the Gulf coast from Austin, and it could be the time of your life. Like almost anywhere else with a coastline, you can theoretically catch waves any time of the year in Texas. Winter swells from the North Atlantic are sometimes strong enough to slip into and cross the Gulf of Mexico, and winter storms within the Gulf often drive large sets. Spring can be the best time of year to surf Texas, with its mix of both late winter and early summer swells. And summer and fall both can host massive hurricane swells, some of which organize into beautiful long-period wave machines. That’s the theory side of things, although the reality is slightly more nuanced. Because timing is everything, and it helps greatly to know where it’s best to go and when it’s best to be there. But if you’re in Austin and have an itch to go surfing or learn to surf, it’s totally doable. Just focus on a couple main spots and don’t burn time hunting anywhere else along the gargantuan Texas coast. For surfers in Austin, the most efficient options for surf are Corpus Christi’s Bob Hall Pier and Port Aransas’ Horace Caldwell Pier , with a spot or two in between. Even if you’re in Austin and just get a wild-hair compulsion to learn how to surf, venturing to the coast can be a fun, beautiful drive that results in one of the finest random weekend jaunts you’ll ever have. You could even do it all in one day! Such an itinerary could look like this: Before you go, get in touch with Texas Surf Camps , which offers lessons and board rentals, and has locations in both Corpus Christi and Port Aransas. They will be able to predict (loosely) the surf conditions for your timeframe. Even if the forecast calls for no surf, driving to the coast always holds an adventure and there are plenty of experiences to be had, both on the beach and on the way. 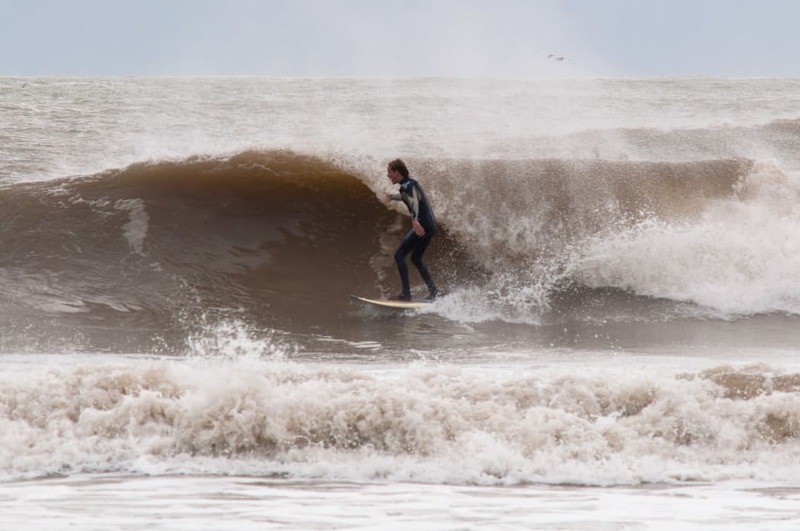 To decide between the Port Aransas route or the Corpus Christi route, think about your style preference: If you prefer a straight, interstate drive, easy city access, and more post-surf venue options, go to Corpus. If you’re looking for really casual, old-salt, slow-burn Texas beach style, visit Port Aransas. This sample itinerary takes the Corpus route. Leave Austin early in the morning, arrive at Bob Hall Pier, and surf all afternoon! Get your post-surf carb refuel near the pier at Padre Pizzeria, dine at an excellent seafood and drink pub like Yardarm, or hit one of the many awesome Mexican dives on the way back to Austin. On your trip, remember that, while surfing in Texas is an incredibly special experience shared by a lucky few, it is still like surfing anywhere else in the world and requires a few mental notes: Surfing (anywhere) is about experiencing the power of nature and sharing it kindly with others. This means that visitors should respect locals as the ones who know Texas waters best. It also stresses the importance of taking care of our precious resources and fragile ecosystem. Texas coastlines are all public. This means that, while anyone can use them at any time (and drive on them), anyone can also abuse them. Don’t be an abuser. Don’t litter. Appreciate but don’t bother marine animals. Leave as little trace as possible…hopefully you know the drill. Most importantly, surfing is about surrendering to nature’s power and letting go. It’s the epitome of the “It’s all good” mindset. So just relax, ride the wave, take things at a nice, slow, Texas pace, and enjoy the ride! Written by Dave Brown for Knockaround.